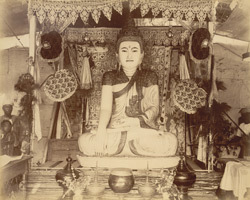 Photograph of an alabaster Buddha in a Burmese shrine from the Curzon Collection, taken by the firm of Watts and Skeen in the 1890s. The Buddha is shown seated with his left hand lying palm upward on his lap and the fingertips of his right hand touching the ground below, in the position known as bhumisparsha mudra. This refers to Buddha calling on Mother Earth to stand witness to the moment of his enlightenment. On his head sits a tiered crown with ornamental flanges known as nagin at either side. The elaborately folded, edged and decorated robe is characteristic of the Mandalay Buddha type. A lace canopy adorned with honorific umbrellas and peacock feathers shelters the image, with offerings of flowers placed before it.